The Reliance Jio 4G SIM cards are soon going to be available to everyone through the website jio.com as we had reported earlier & this could mean that we would start seeing more users on the network. Now that would hint that we would see more congestion on the network, probably slowing down the speeds we are currently seeing. To make it clear we are going to test these speeds every 3 months, to check if there’s any decrease in the speeds or if Jio is able to offer the same service even when there are more users on the network. We initially tried to perform this test on the LYF Branded Phones like the Earth 1 & Flame 6 that we have but felt it would probably be biased hence opted for Samsung Phones that support 4G. 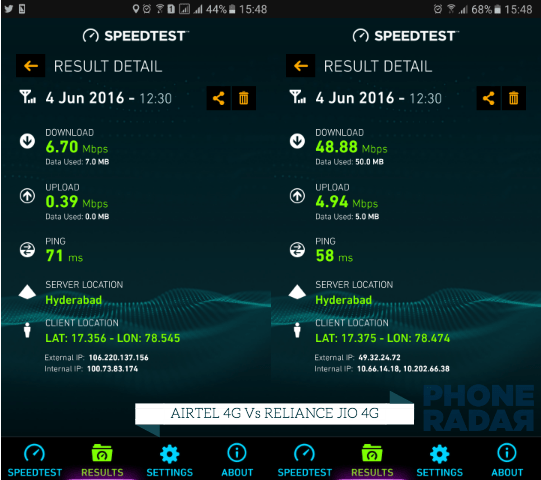 In this speed test, we compared the Airtel 4G service with the Jio’s 4G service on the same series of Smartphones to see if there’s a major difference. We were not surprised to see 50 Mbps speeds from Jio because that’s already been in the news, the surprise was when Airtel 4G speeds could not cross 1 Mbps while uploading files. This is seriously not expected from a brand that has been pushing some major TVC’s & advertisements promising very high speeds & a coverage almost anywhere in the country. RJOI is on the verge of breaking the telecom industry with some highly competitive packages that could make most of the users to switch to the network. We are going to share some Prepaid & Postpaid Jio Plans in the coming week. In order to keep it fair, we did this test twice back to back & the results were consistently showing that Jio was able to hit at least 7 to 8 times than what was reported on the Airtel connection. We also tried to do a comparison with Vodafone 4G but it could not latch to the network while this video was made & hence we finally went to compare just the two networks that have been trying to promote their 4G services in the recent times. Followed is a video that shows the same tests & if you think we should do a similar test in outdoor location, let us know.